A former official in East China's Anhui province nicknamed "the director in the White House" was sentenced to death with a two-year reprieve yesterday for taking bribes, and retaliating against and framing an innocent person. The sentence was handed down to Zhang Zhi'an, former Party secretary of Yingquan district of Fuyang in Anhui province, by the Wuhu Intermediate People's Court yesterday afternoon. Wang Cheng, the district's former chief prosecutor, was also sentenced to six years in jail for helping Zhang. Both Zhang and Wang refused to accept the verdict. "I'm innocent! I want to appeal," Zhang shouted after hearing the verdict in court. He was so emotional he even knocked down a microphone in front of him, according to the China News Service. Zhang has been accused of getting revenge on Li Guofu by making up false charges against the man, who later committed suicide in a local detention house. Li's family was also dissatisfied with yesterday's verdict, calling for an immediate death penalty. Zhang was also accused of abusing power, and taking and asking for bribes 52 times involving a total of 3.6 million yuan ($527,000). In 2007, Zhang was given the nickname of "White House director" by locals and netizens after he was found to have spent 30 million yuan to construct the district government office building that looks identical to the US White House. In August 2007, Xiao Hua, a secretary of the Fuyang city government, intercepted a letter that reported Zhang as being guilty of bribery, making money out of selling government posts and abusing power. The secretary then gave the letter to Zhang. Believing the whistleblower who wrote the letter was Li Guofu, then director of the business and commerce development bureau of Quanbei trade zone in Yingquan district and director of a local real estate company, Zhang decided to take revenge. He wrote a letter containing false accusations of Li's misbehaviors, including embezzlement, taking bribes and abusing power to help his children find jobs. He sent the letter, as if it was written by an anonymous person, to local police, the procuratorate, the court and himself. He then put pressure on the local procuratorate, police, disciplinary inspection department and other relevant departments to investigate Li's case. After the district procuratorate started an investigation on Li, letters that Li wrote to report Zhang's misbehaviors were found at Li's home. Chief prosecutor Wang then handed the letters over to Zhang. In September 2007, Li was arrested and detained at Fuyang detention house. Zhang then interrogated Li about his alleged corruption, and forced Li to confess after Zhang threatened his family. 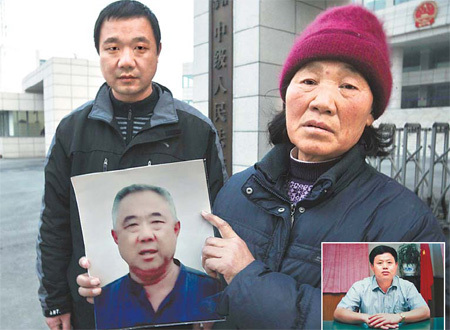 On March 13, 2008, after more than five months in the detention house, Li died at the prison hospital. The official report said he hanged himself. Li's family said both of Li's eyes had become blind before he died, according to local media reports. The unnatural death of Li gained attention from the public and media. In July 2008, the Anhui provincial procuratorate decided to investigate the case, and Zhang was prosecuted in December 2008. The Wuhu Intermediate People's Court opened the court session last November. Thirteen officials serving at district and town levels have been suspended since July for allegedly having bribed Zhang for promotions between 2001 and 2008. Xu Xiaobai's fried chicken shop is able to draw customers with a large sign reading "authentic Taiwan flavor". As China continues to open to the outside world, mixed marriage becomes more and more popular.